So what’s the point of having a multi-million mansion if you never live in it? That’s what many people are asking after reading an MSNBC.com article about heiress Hugette Clark, who inherited her father’s Montana mining fortune and promptly became a recluse. However, that doesn’t mean that she’s given up her family’s estates, including very expensive properties in California, Connecticut and New York. Her father was once a senator and copper magnate reported to be among the richest men in the world whose political career was ruined after it came out that he bought his way to power. Now 104, Clark has chosen to spend her remaining days inside a hospital — her health reportedly deteriorated and she has spent the past 22 years inside of a hospital or nursing home after the death of her mother. She’s shut out the rest of the world, only speak to her attorney and her accountant. Her seclusion has also meant that her extensive personal properties have sat dormant for decades. 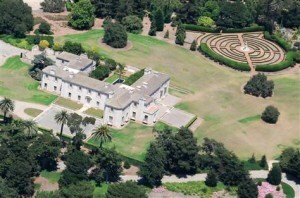 She has a $100 million, almost 22,000-square foot estate in Santa Barbara called Bellosguardo which she apparently hasn’t visited in 50 years. However, a team of groundskeepers perform daily maintenance on the estate following handwritten instructions she sent decades ago. Also sitting unused but well taken care of is her Connecticut “country home” — an almost 13,000-square foot house currently on the market for $24 million and her 42-room apartment overlooking Central Park. In fact, Clark is so reclusive that the caretakers who are in charge of maintaining her estates aren’t even sure if she is dead or alive.